Martin was ready to transform his skinny frame to muscular stature. 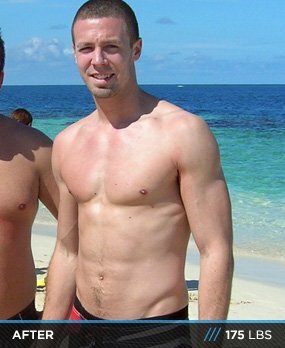 Despite criticism from friends, he changed his workouts, diet and lifestyle and reached 5% body fat! Until I was 19-years old, I'd always been one of the skinniest guys out there. One day, I decided to go to the gym and give it a try. At the beginning, I didn't know a lot about nutrition and bodybuilding so I was doing everything I wanted at the gym and slowly began gaining weight. I gained 15 pounds the first summer, part muscle and part fat because of my bad nutrition. I never had the opportunity to see my abs in the past, and I never thought I could see them in the future until I became interested in nutrition. 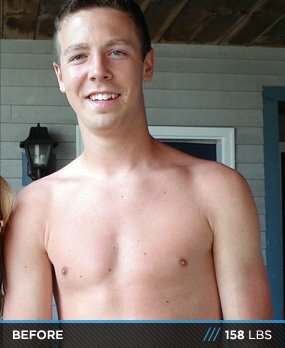 From this point on, I started researching nutrition plans and tips on Internet, especially on Bodybuilding.com and slowly started seeing results. Not only was I seeing results, but my entourage also did. That is one of the best feelings, and it keeps you motivated. Also, when someone asks me how I did my transformation, I always answer the same every time: "Lifting weights and eating clean isn't a task, it's a way of living. And the best way to reach your goals is to have fun doing it!" That's how I did it. Also, when someone tells me he has no time for exercise, I simply answer: "You just have to take the time, make it a passion." First of all, training is important, but eating clean is far more important. This being said, I started eating 6 clean meals per day to boost my metabolism. I usually get around 3500 calories a day (because of my fast metabolism), mainly protein with carbs and good fats. From that point on, I lost 5% body fat mainly on the belly by splitting my calorie intake throughout the day. My trainings consist mainly of lifting weights with supersets, with low rest time to get my heart rate up. This way, I not only build muscle, but I burn fat as well. Of course, I try to rotate my workouts throughout the year to shock my muscles with new exercises, and Bodybuilding.com helped me a lot with their workout programs. I do my cardio 2-3 times a week, by playing basketball in a league and I try to run as much as I can during the summer. This has been a long process, with all the time and energy I spent at school and at work. I do not want to go back to my old body, and my new lifestyle makes me feel great by challenging myself the way I have never been challenged before. I always try to reach new goals. Also, some of my friends think I'm crazy and I deprive myself, but not at all. I love my new lifestyle, life is a sport and I enjoy it! We only got one body, let's care about it. Go all in or don't go in at all.